Terrain Water, water and more water. Other Species Fish. Lots of them. Population Small because their entire population is centered on a tiny base in the middle of an endless sea. Points of Interest The Sea, Tipoca City, the Sea. Kamino is a planet far, far away, mostly consisting of water. Lots of water. It is often referred as The Big Sea Planet and that place where they made the clones and stuff. 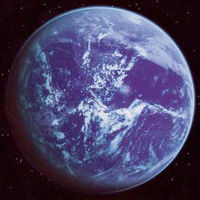 Erased from Jedi records, the planet was only discovered by Obi-Wan Kanobi when he landed there and fought Jango Fett, who promptly fled like a little wuss. Home to many millions of species of fish (they take up the majority of the planet's life), the main species of Kamino are coincidently called 'Kaminoans'. They are long necked alien like beings, and are a nice change to fish. Without Kamino, we wouldn't have THIS! 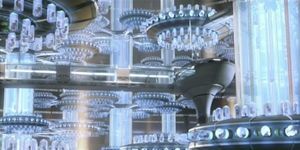 Scientists have found that Kamino originated a few billion years ago, when God created it in three days (he had improved his skills greatly since earth). On the third day he got angry with it and created a storm, then left. However, he accidently locked the settings and he could never revert the storm, no matter how many computer technicians he called in. The storm continued until the entire planet was covered with water, and Darwin's theory jumped into process. Fish began to swim in the depths. Then more fish came. And more. And more. There were many fish. Eventually the Kaminoans evolved from the fish and built their city, where they lived. Kamino is basically a very, very big sea. A very big one. Many people even think that it is not even a planet, just a big orb of water. The climate is very cold, and very often freak storms strike the single city, Tipoca City. These storms create huge Tsunamis. Conveniently, no flooding occurs as there is no more land to flood. However, if one Kamino kid leaves the back door open then their entire city will be flooded and they will all die. Smart, eh? There are exactly two sunny days a year and these are met by huge festivals where hoards of Kaminoans bask in the sunlight and earn a long waited tan. Sadly this is the cause for many deaths, as Kaminoans do not have a cure for skin cancer. Very unhabitable, unless you are half fish, which technically Kaminoans are. The distance of the atmosphere are perfect for life - fish life, however, and not much else. But considering that the first thing that scientists look for when trying to find life on a planet, is water... well, I don't have to say much more, do I? Fish. Have we said it enough? The estimated amount of irrigated land in 1993 was 0 square kilometres, unless you count that old seaweed farm that was abandoned two days before we did this graph. Here is where they make lots and lots of clones. Lots of them. A strange, long necked, thin, spindly, weird speaking and the second most despised Star Wars species (after the Gungans). 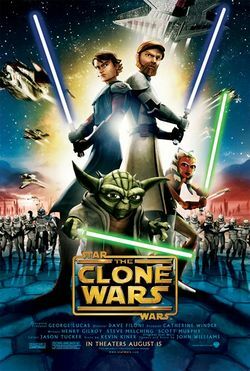 Highly sophisticated, they are recognised as creators of the clones, but do not play any part in Star Wars whatsoever. They are huge polygamists and this is considered normal, as they make many clones. The Kamino Empire is pretty flimsy and based around the single city of Tipoca city, which consists of several circle shaped buildings hovering over the water. Tipoca city was built somewhere around 5000BC (which is coincidently 'a long time ago'). There were only a few first inhabitants, but eventually (due to their unique cloning process), their population grew until it was too large to fit into their single city. 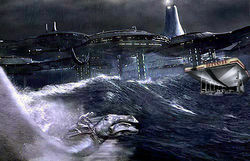 Heavily under budget from a lack of ships to carry seafood and clones out to other planets, the government commited mass genocide and threw at least a thousand Kaminoans into the sea, tied to metal weights, where they would drown. Some managed to escape and form an alliance, but they were wiped out by the government years later. Ten years after the genocide, a large deposit in metal allowed the Kaminoans to build another fleet of ships and their export industry boomed. However, with the rise of the Sith they fell into decline again. As 'mentioned' before, the entire population is situated in Tipoca city, in the middle of the endless sea. The city is divided into four sub-sections - Imperials, middle class, peasants and Canadians. However, there are no toilets in the entire complex, which is considered the only flaw in the entire city. The Kaminoans have a very rigid culture and spend most of their time lying around, or scuba diving. They have no visible religion, either, but legends about land and fire were often passed through the generations. A giant flying stingray and its rider approach a convenient gas station. 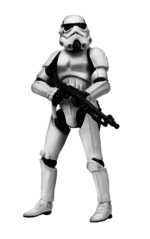 Kamino is a communist country, and is ruled by Prime Ministers, however they may have to change because of copyright infringement with earth. Their current leader is Prime Minister Lama Su. If you want to know more, look up 'Prime Ministers' on Wikipedia or something. We're not going to fill this page with that inane crap. Although they make many clone soldiers, Kaminoans have never thought of actully using them in their own army. Because of this they only have a three hundred strong army, consisting of four sub-groups. Army: Nonexistant as there is no land on Kamino. As detailed in the weather section, Kamino is prone to frequent storms and tsunamis, however they use their flying stingrays to fly above the waves, although with no coverings or anything they get very wet. Also, unlike cars, giant flying stingrays do not carry onboard GPS, radio or DVDs, making the stingrays considered very unreliable transport. This is also because they stop for frequent fish meals, which cars do not. As there are no left and right lanes, there are many crashes, and because of the lack of airbags, many deaths occur, even from harmless traffic jams. This page was last edited on 17 February 2013, at 19:58.